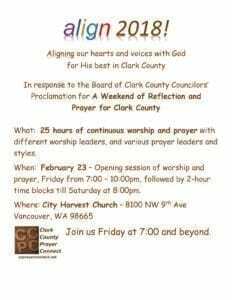 VANCOUVER — In response to a proclamation by members of the Clark County Board of County Councilors establishing a weekend of reflection and prayer for Clark County, the local faith organization Clark County Prayer Connect is hosting Align 2018!, a 25-hour segment of continuous prayer for the county. 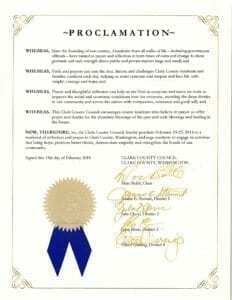 In response to the proclamation, Fuqua said that Clark County Prayer Connect had always done some form of communal prayer for the county during the designated weekend. Three years ago, they decided to move beyond simply having an evening of prayer during the weekend and create an entire 25-hour period of continual prayer and worship. Align 2018! begins at 7 p.m. on Fri., Feb. 23 and concludes at 8 p.m. on Sat., Feb. 24, and will be held at City Harvest Church, located at 8100 NW 9th Avenue, Vancouver, WA, 98665. Fuqua said that the name of the event, “Align,” “is one of the best words that describes what prayer accomplishes.” It is an act of aligning “our hearts, our words, our spirits with His will,” Fuqua explained. The event will be divided into 10 segments of two to three hours each. Each segment will feature a different worship team and prayer leaders, with about half of the segment devoted to musical worship and the other half devoted to prayer. Fuqua said that there will be a variety of worship segments, including contemporary, Hispanic, Slavic and traditional hymns. During the event itself, Fuqua expects that several county council members will attend the opening session, at which the proclamation will be read and attendees will have the opportunity to pray in person for the county leaders. There will also be four prayer stations set up, each with a different theme. The themes include praying for those in authority, praying for Clark County, praying for peace and praying for unity. Clark County Prayer Connect sent out the proclamation to pastors in the county and encouraged them to read it in their congregation during the weekend and pray for the county as well. Fuqua explained that “we really value the unity of the body of Christ,” and Align 2018! is designed to foster unity through prayer in the church. He said that in previous years, between three and five hundred people in total attended at some point during the 25-hour period. The mission of Clark County Prayer Connect is to “encourage more, better, united, strategic prayer by and for the people of Clark County,” Fuqua said. Align 2018! is just one instance where the group facilitates that mission. In May, Fuqua said that the group will emphasize the National Day of Prayer, held on May 3, with a pastors’ breakfast and encouraging prayer gathering. Clark County Prayer Connect also stages an event every August called “One Hour” where Clark County residents are encouraged to take one hour during a four-day period to go to a local school in the evening and pray for the kids in the school. Fuqua also explained that Clark County Prayer Connect encourages an ongoing “One Day” ministry where local church congregations are encouraged to establish a 24-hour period to be in constant prayer. More information about Align 2018! and Clark County Prayer Connect can be found online at http://ccpc.prayersummits.net/.